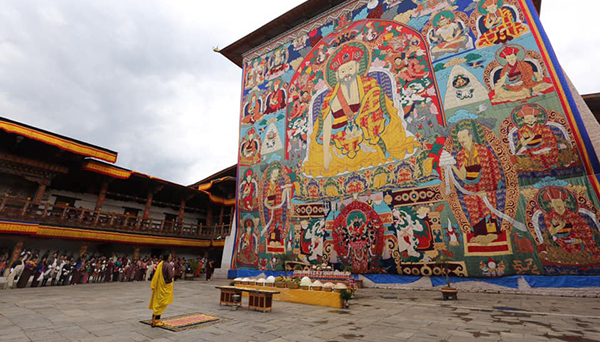 The Zhung Dratshang performed the prayer ceremony at the Kuenray of Punakha Dzong. The ceremony was presided over by the Dorji Lopen. Zhabdrung Kuchoe is the anniversary of the passing away of Zhabdrung Ngawang Namgyel. Zhabdrung is revered as a great Lama, a builder of Dzongs and important religious structures that remain Bhutan’s architectural heritage, and as the unifier of Bhutan, who designed a dual system of governance to administrate over the whole country until the Monarchy was established in 1907. Zhabdrung Ngawang Namgyel entered into meditation at the age of 58 at the Punakha Dzong in 1651.